Orthodox Church liturgical Bishop clergy vestments (black-gold) by Istok Church Supplies Corp.
Bishops occupy one of the highest offices in Orthodox Christian Church hierarchy. Their liturgical vestments are rich and elegant, highlighting the dignity and significance of the office bearer. These vestments have evolved over centuries and employ symbolism to convey the loftiest ideals and teachings of the Orthodox Christian faith. Istok Church Supplies feels deeply honored to present Bishop vestments in black and gold that are must haves in times of the Great Fast. A Bishop’s complete vestment set consists of various articles including sakkos, zone, epigonation, epamanika, epitralhilion, sulok, large omophorion and small omophorion. We include all these items for the bishop vestments we offer and give customers the option of adding matching chalice covers, veils, an embroidered icon on the back and high quality velvet inserts to their orders. 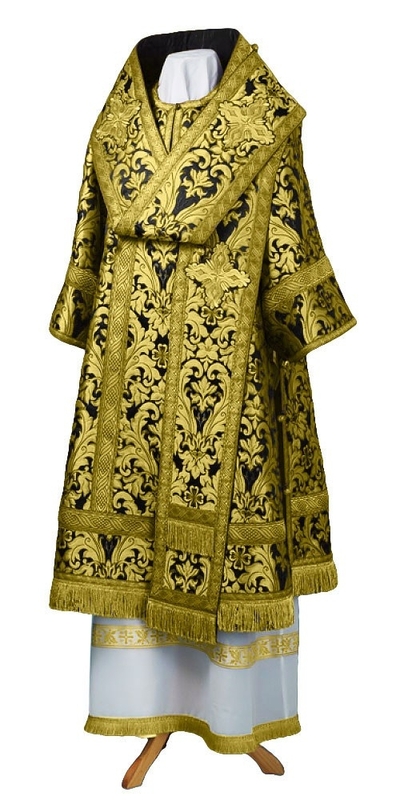 We offer our Bishop vestments in black and gold with three fabric options – metallic jacquard brocade, rayon jacquard brocade and German velvet. Prices for metallic and rayon jacquard brocade vestments differ depending on the class of fabric being used. Customers who would prefer a different fabric belonging to the same class can make a mention of their request in the Notes section of their order. For decoration, we provide three options – standard, premier and luxury. While the standard type is cost effective and includes inexpensive galloon and plain crosses, the premier type consists of beautiful crosses and high quality trimmings. The luxury style comes with excellent quality jacquard galloons and rich, hand embroidered crosses. From the fabric to the quality of decoration, Istok offers plenty of opportunities for customers to purchase these vestments according to their discretion and preferences. When our master craftsmen create Bishop vestments in black and gold combination at our European warehouse, they take extreme care to ensure that all canons and traditions for construction are followed. Our ultimate aim is to provide our customers with vestments that uphold the dignity of the wearer and his office within the parish and community he serves.